Pakistan is trying hard to revive true cricket spirit and for that reason they invited Bangladeshi women cricket team here. In first T20 international; Pakistan Women Cricket team defeated Bangladesh by 29 runs at the Southend Club ground in Karachi on Wednesday. In reply to Pakistan's 125-run target, Bangladesh could only score 95 for seven wickets in their 20 overs. Ayasha Rahman scored 23, Fargana Hoque 23 and Rumana Ahmed 22 runs. Earlier, Pakistan skipper Sana Mir won the toss and opted to bat. The team reached their score of 124 runs with the help of Bisma Maroof's 65 and 44 runs by Javeria Khan. Anam Amin grabbed two wickets for the green-shirts. The visiting Bangladeshi women team will play their second T20 on October 2, followed by the ODIs on October 4 and 6. The series in Karachi is a welcome sign for the return of international cricket to Pakistan, where no international cricket matches were played between 2009 and 2015 after a terrorist attack on the Sri Lanka team's bus in Lahore in March 2009. Before Bangladeshi team arrived, few months back Zimbabwe men's side toured Pakistan in May-June this year for two Twenty20 internationals and three one-day matches. Security is on high alert and cricket lovers are hopeful that in future more cricket teams will come to Pakistan and that will revive international cricket here. 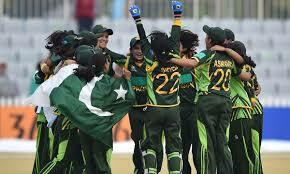 Pakistani Women team was highly applauded on their good performance on social media as well.